The 2018 spring sports season is wrapping up, and over at Shore Regional High School in West Long Branch that usually means the teams are in the state tournaments. 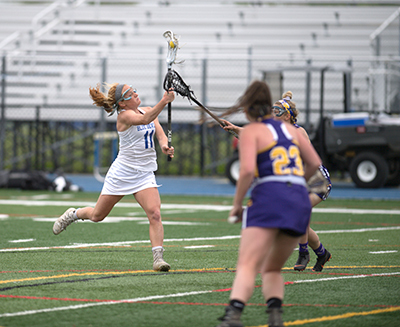 Girls lacrosse NJSIAA Central Jersey Group 1 tournament kicked off last week and the Blue Devils of Shore received the number three seed. They faced the Purple Roses of St. Rose High School in the quarterfinals. St. Rose entered the tournament as the sixth seed. Both schools had a bye in round one. Working the ball against the St. Rose defense is Sophie George (1) of Shore Regional HS. Shore quickly and easily demonstrated why they are one of the top teams in that bracket. 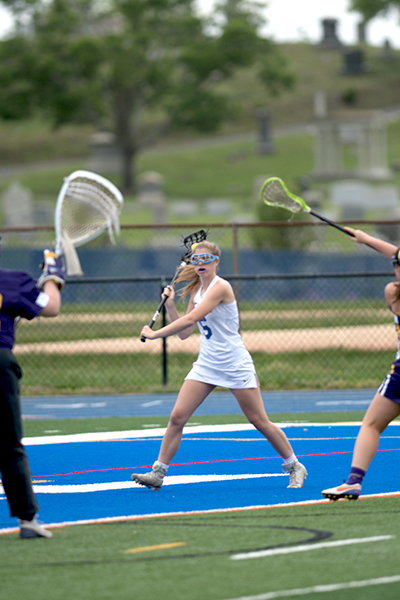 They beat the Purple Roses 18-6 and advanced to the semifinals where they will face the second seed Mount St. Mary, who beat Trinity Hall, the seventh seed, 19-4 in their quarterfinal game. Leading the Devils in goals was Ohio State bound Mary Kate George with five goals and five ground balls. Sophie George and Ryan Malfa each had three goals and three ground balls. Lily Santi scored twice for Shore and getting single goals were Renee Bongarzone, Holly George, and Kelsey Moore. In the goal for the Blue Devils was Cailey Canesa who made 11 saves. Shore which plays in the Class A Central division of the Shore Conference has a 10-2 league record and with this win are 12-6 overall. Shore finished second in the division to the undefeated Bulldogs of Rumson-Fair Haven. 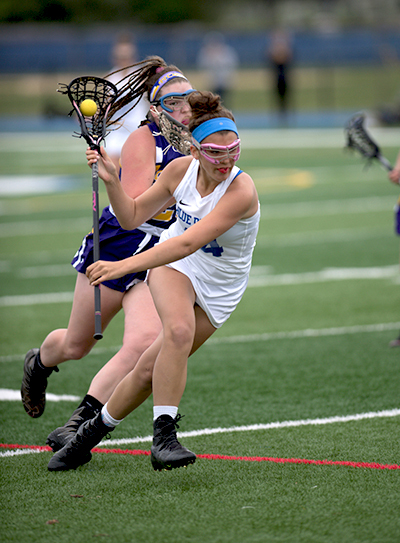 Using quick feet and great stick work is Holly George (14) of Shore Regional. Leading all scorers in the 18-6 win over St. Rose High School was Mary Kate George (11) with five. She will be playing lacrosse next season at Ohio State University. 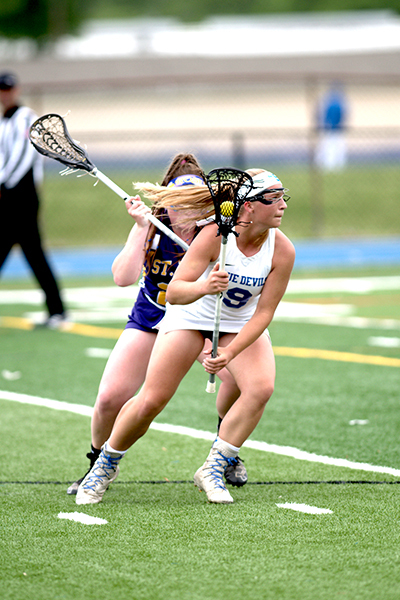 Scoring one goal in the 18-6 win over St. Rose was Renee Bongarzone (5) of Shore Regional.